The problem is starkest in Allahabad and Delhi universities where 98.36 and 93.10 per cent seats reserved for SCs and STs are vacant. New Delhi: Over 80 per cent seats reserved for Scheduled Castes and Scheduled Tribes at the level of professors and associate professors at central universities are currently lying vacant. At a time when central universities are already in the midst of controversy over the issue of reservation for faculty, the government’s response to an RTI application filed by ThePrint has revealed that 904 of the 1,125 seats reserved across 40 central universities were vacant as on 1 January 2018. While massive vacancies are a problem across the country’s central universities – 33 per cent teaching positions are lying vacant – the problem is much starker in the case of reserved seats. While the vacancies in seats reserved for Scheduled Castes is 76.99 per cent, those in seats reserved for Scheduled Tribes is 87.5 per cent. “Universities often cite the problem of not finding suitable candidates when it comes to reserved seats, but the point is that the seats are only reserved in very abstract, specialised departments where it is hard to find candidates,” says Vivek Kumar, professor at Jawaharlal Nehru University. “Seats are seldom reserved in popular departments like English, History, etc.,” he added. While in March, the University Grants Commission (UGC) issued a notification announcing that the number of reserved faculty posts across universities and colleges would be calculated department-wise and not university-wise, experts worry that such a notification is only bound to further reduce representation of SCs and STs in the faculty. In Banaras Hindu University, where reservations are calculated department-wise, for instance, only 4.06 per cent of the total seats at professor and associate professor level are reserved for SCs and STs – as opposed to 22.5 per cent mandated by the law. The new UGC formula, which was arrived at on the basis of an Allahabad high court ruling, has been currently stayed by the Supreme Court after the central government intervened, arguing that the formula “drastically reduces, and, in many departments completely wipes out, the representation of members of SC/ST community”. 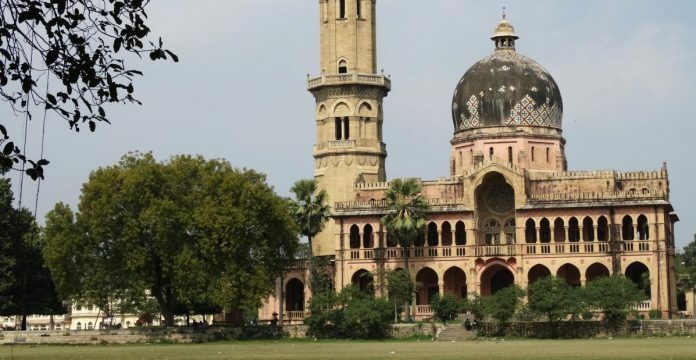 In Allahabad University, which was deemed a central university in 2005, the situation is the worst with 98.36 per cent of the reserved seats lying vacant. “They were made a central university fairly recently, so they are still in the state university mode,” says Kumar. The figure for Allahabad University is based on information as on 1 April 2017, since the university has not furnished the latest information. 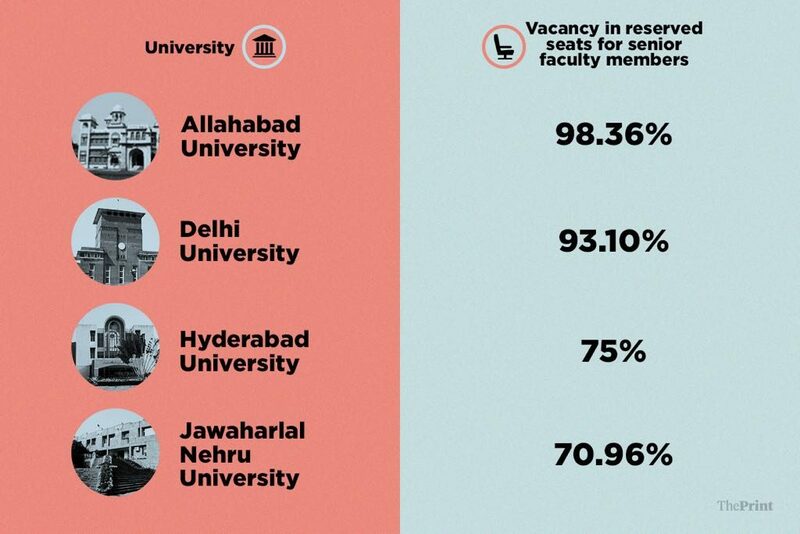 However, universities like Delhi University, JNU and Hyderabad University do not fare well with 93.10 per cent, 70.96 per cent and 75 per cent vacancies respectively either. “Universities and institutions of higher learning are the last bastions of upper caste and upper class Brahmin orthodoxy,” says Dalit leader Ashok Bharti. “The knowledge system is still controlled by the Brahmins,” he adds. While the representation of the two communities is shockingly low at the level of professor and associate professor, it is relatively better at the entry level of assistant professor. Abysmal as it may be, the representation of SCs and STs is still better-off than their OBC counterparts, who have no seats reserved at associate professor and professor levels. Even though the Supreme Court mandates 27 per cent reservation for OBCs, in central universities, this reservation was scrapped at senior faculty levels in 2016 by the UGC. According to the rule formed by the Commission in 2016, 27 per cent OBC reservation in teaching positions was only restricted at the level of assistant professor. “University Grants Commission’s order of scrapping reservations for OBCs is a neglect of the Supreme Court that says there should be a 27 per cent reservation for the category in all government institutions,” argues Subodh Kumar, a faculty member at Maharaja Agrasen College Delhi University. “The commission is coming up with its own rules, which we keep fighting. We have been fighting against this reservation order for a long time now but the reason this agitation is not getting strong is also because of the low representation of OBCs in the university system,” he added. With inputs from Kritika Sharma.